I am the owner of a landscape design and maintenance company. The community, having new skills and practices to take off the mat and into my everyday life. 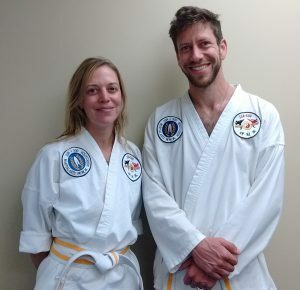 What is something people at Tae Kwon Do probably don’t know about you? After meeting my husband 11 years ago, I moved into his mother’s garage with him so we could save money to travel. We had only known each other a few months and had only spent about 4 weeks of that time together in person. Every time we as a class share in a laugh about anything – these are my favorite moments. Practicing here has given me more space in my life and I have less anxiety in general and am more confident off the mat. To be grounded, to support others, to build authentic relationships, to move my mind and my body. Poetry, time in nature, traveling, photography. I spent 9 months traveling cross country in a van. When Master Morris cried telling the story about how an elderly woman noticed the vitality in his eyes and actually shared that with him, even though they were complete strangers.